Apple has seeded and updated several of its software platforms which includes; Mac OS X Yosemite 10.10 Developer Preview 8 1.0 (DP8) (Build: 14A361c), OS X Yosemite 10.10 Public Beta 3 (Build: 14A361p), Xcode 6.1 Beta 2 (Build: 6A1030), OS X Yosemite Recovery 3.0, Apple Configurator 1.7 Beta 6, iTunes 12 (Build: 12.0.0.117), Keynote, Pages, Numbers, Find My iPhone Apps for Mac OS X and iOS Devices i.e. iPhone, iPad and iPod Touch. The official Direct Download Links of Setup Installer / Update .DMG Files are available below. 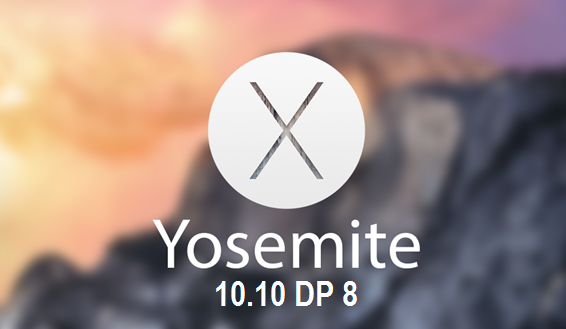 Mac OS X 10.10 Yosemite Developer Preview 8 (DP8) (Build: 14A361c) Update is a pre-release beta version, and its official changelog holds several new changes in features and functionalities. Whereas changelog of Xcode 6.1 Beta 2 (Build: 6A1030) Update contains; new OS X 10.10 SDK and iOS 8 SDK requires for apps development. OS X Yosemite 10.10 Public Beta 3 (Build: 14A361p) Update changelog comprises; the same features and functionalities changes that OS X developers saw in Yosemite Developer Preview 7 pre-release version. OS X Yosemite 10.10 Developer Preview 8 Changes & Features? 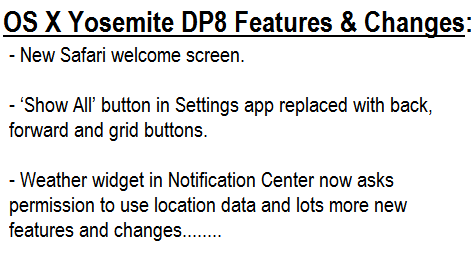 How to Download & Install OS X Yosemite DP8 and OS X Yosemite Public Beta 3 Manually? Mac OS X general public users and developers can update / upgrade current software version automatically to the latest available OS X Yosemite DP8 (14A361c) or OS X Yosemite Public Beta 3 (14A361p) via Mac App Store >> Software Update tab. Mac OS X developers can navigate to OS X Dev Center website for official OS X Yosemite DP8 Downloads, while Mac OS X non-developers and OS X Public Beta Seed Program members can navigate to Apple OS X Beta Seed Program website to manually download, install and activate OS X Yosemite DP8 or OS X Yosemite Public Beta 3 via iTunes without Apple UDID and without OS X Developer Account for FREE. You can also Download OS X Yosemite 10.10 Developer Preview 8 1.0 (14A361c) Combo / Delta Update .DMG File, OS X Yosemite 10.10 Public Beta 3 (14A361p) Standalone Setup Installer .DMG File for manual installation via Bootable USB or DVD.